When I was in grade school we were given the task of inventing something to solve a problem. Being all of 10 at the time I decided I wanted to be able to make a batch of brownies that would all have sides because everyone knows that the chewy sides of a brownie are the best part. 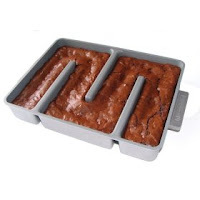 I took a few aluminum baking pans and with adult supervision cut them and put them back together so that all the brownies would have two sides. I don’t remember exactly how the whole thing went down, I do remember there were a lot of rejects that made their way into the teacher’s lounge despite wanting to share them with the class. Well wasn’t I surprised to read that Megan at Not Martha has been baking up a storm with a Baker’s Edge Pan! Who knew I was such a visionary at 10? If only I had thought to patent my invention… I have to say that this version is a bit sturdier and has less sharp edges than my version. I may just have to get one.